Delta-5-desaturase (fatty acid desaturase-1, FADS1) and delta-6 desaturase (fatty acid desaturase-2, FADS2), rate-limiting enzymes in the biosynthesis of long-chain polyunsaturated fatty acids, may be associated with the risk of metabolic syndrome (MetS). We investigated how FADS1 rs174547 and FADS2 rs2845573 variants modify the prevalence of MetS and whether the risk is modulated by interactions with dietary fat. Genetic, anthropometric, biochemical, and dietary data were collected from the Ansan/Ansung (8842 adults) and City–Rural (5512 adults) cohorts in Korea. The association between FADS1 rs174547(C/T) and FADS2 rs2845573(C/T) variants and MetS was analyzed, as was the interaction of genotypes and fatty acid intake and the risk of MetS after adjusting for MetS-related confounders. Carriers of FADS1 rs174547 and FADS2 rs2845573 minor alleles had lower serum HDL-cholesterol and glucose levels and higher triglyceride levels than those with major alleles. Ansan/Ansung cohort individuals with FADS1 minor alleles or haplotypes of FADS1 and FADS2 minor alleles had increased risk of MetS, including lower serum HDL-cholesterol and triglyceride levels and blood pressure after adjusting for MetS-related confounders. The City–Rural cohort showed similar results. 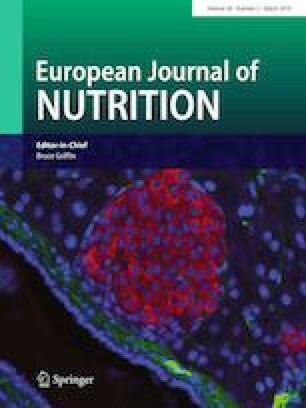 Total fat intake showed interactions with FADS1 and haplotype variants on MetS risk: MetS frequency was reduced in people consuming moderate fat diets as compared to low fat diets in FADS1 and haplotype of FADS1 and FADS2 major alleles. Korean carriers of the FADS1 rs174547 and FADS2 rs2845573 minor alleles have a greater susceptibility to MetS and moderate fat intake protected against the risk of MetS in carriers of the FADS1 major alleles. SP participated in the experimental design, analyzed the data and wrote the manuscript; XZ analyzed the data; and SK participated in discussing the results and writing the manuscript. All authors listed in a manuscript have contributed substantially to the work and have seen and approved the submitted version. This paper has not been published previously, is not under consideration for publication elsewhere. This study has been financially supported by Korea Research Foundation (NRF-2015R1D1A3A01019577) and Traditional Culture Convergence Research Program through the National Research Foundation of Korea(NRF) funded by the Ministry of Science and ICT (NRF- 2016M3C1B5907152). This study was approved by the Institutional Review Board of the Korean National Institute of Health for the KoGES. Written informed consent was obtained from all subjects. Informed consent was obtained from all individual participants included in the KoGES study.